Manufacturer : Spectrum Technologies The Field Scout Direct Soil EC probe permits instant, accurate measurement of salts in soil media as well as water or nutrient solutions. 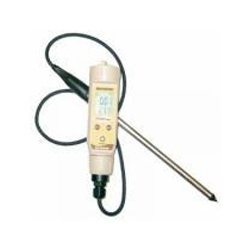 Use this portable EC meter and probe to measure soil salinity in greenhouse soil media right on the spot, without conducting tedious soil sampling and soil preparation. EC Probe and Meter Jab Sensor for Soil and Water 2265. The Field Scout soil (water) EC probe permits direct measurement of salts in soil media as well as water or nutrient solutions. 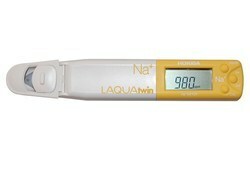 Use this portable EC meter and probe to measure soil salinity in greenhouse soil media right on the spot without conducting tedious soil sampling and soil preparation techniques. Greenhouse production managers can compare readings from plant to plant and fine-tune their fertility program. Measurement can be made directly in the plug tray cell without cannibalizing the seedlings. Turf managers can monitor for high salt levels on golf course greens and determine when to flush (leach) salts before turf quality declines. 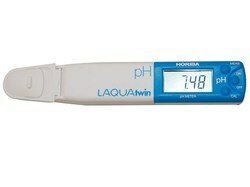 Check your water quality or nutrient solutions using the same probe. Resolution 0.01 mS/cm. Accuracy± 2%. Automatic temperature compensation. Includes case, calibration standards, and battery. 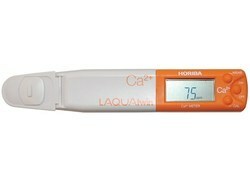 2254 - Conductivity Standard 2.76 mS/cm. Manufacturer : Spectrum Technologies Based on an exclusive patent license from NASA, the Spectrum Chlorophyll Meter uses point and shoot technology to instantly tell you relative chlorophyll content, a key early indicator of plant health. Detects Stress Earlier Than Visual Monitoring-Before Plant Growth Is Affected. Integrates a large 0.5" diameter area at 12" on a plant leaf or a 4.5" diameter spot on turf grass at 4 feet. High powered lasers outline the edges of the measured sample area of leaf or canopy.Ambient light sensor automatically corrects for varying light conditions. The handheld Spectrum meter calculates and displays a running average for multiple readings while simultaneously recording each sample in the built-in data logger for detailed analysis later at your PC. Data logger can function with or without GPS/DGPS. Requires cable. Durable and highly portable, the Field Scout Chlorophyll Meter is an essential tool for more effectively managing your nitrogen program. Use the powerful SpecMaps online application to discover the value of spatially variable sensor measurements.